The situation put the onus of attack on the Confederates. They had advanced intending to attack Blunt's position on the Kennard Plateau, but received a last-minute report that reinforcements from Missouri were approaching from the NE, and appeared to be weary. They now had a choice of which Union force to attack first. Both had merit in my view; and creating that choice was one thing I was trying to achieve with the scenario design. I think the game turned on the decision by the Union reinforcement commander Herron (played by Niall) to make a wide flank march to link up with Blunt. This was actually a very brave course of action, and could have proved disastrous if the Confederates had decided to attack Blunt instead. This long march would have given them more time to crush him. As it was, the decision proved to be inspired, and I fear poor Niall is destined for a long career as a division commander as a result! On the face of it, the Rebs had a number of advantages in this scenario. Their army was somewhat larger, they had the initiative, and a central position against widely separated Union forces (see map below). However this was balanced (and probably more than balanced), by several weaknesses. Their army was newly-raised, and not well-trained. Some of it, being conscripted, was not especially enthusiastic. The Union had many more guns, and better ones at that. There were also rebel command weaknesses built into the scenario.......more on that anon. When I first announced this game, I described it as hypothetical. This was a fib, as it was actually based on the Battle of Prairie Grove in December 1862. My excuse is that I didn't want players reading-up about the real campaign and battle. To further muddy the waters, I set my game 2 months earlier, and made Price the Confederate commander, rather than Tom Hindman. My plans were almost scuppered however when the new Prairie Grove battle-pack came out a few hours after I mailed the game briefings! I should have foreseen this, as 7th December was the 150th anniversary of the battle. Thankfully, there are a number of differences between the pack and my scenario. Not the least of these was that the battle pack assumes the engagement took place at the historical site, and actually commences part way through the battle, whereas I wanted to allow pre-battle manoeuvring. Historically, Hindman did a masterly job of organising the new rebel army, and bringing it close to Blunt's vulnerable division. Receiving word of the Union reinforcements from Missouri, he was then faced with broadly the same choices which faced the Confederate team in the scenario. Like Neal, he opted to attack the Union reinforcements to the N of him, rather than Blunt's force to the W.
Here is where our game diverged from history, as the historical Union reinforcement commander (Herron)attempted to bull through towards Blunt by the most direct route. Although he was heavily outnumbered, this was not utter madness, as he had a powerful artillery arm. His cavalry were pretty worn-down by the forced-march from Missouri, but his infantry, although consisting of only 6 rather weary and mostly new regiments, were good. The nightmare march had meant thousands had fallen by the wayside. But it also meant that only the physically and mentally tough had survived. These 6 regiments were arguably the most effective troops on the field. While the outnumbered Herron attacked, the normally assertive Hindman went onto the defensive. Maybe he was less than confident about his army, or maybe he just was not cut out to be a battlefield general. Such counter-attacks as the Rebels made during the afternoon, were on a small-scale and apparently ordered by middle-ranking officers. For all that, the outnumbered Herron was soon in trouble, and Blunt realised that he needed to march to support his subordinate, rather than the other way around. By a flank march worthy of Niall, he eventually achieved this, and himself launched an attack. Like those of Herron earlier, this broke down in the face of Confederate numbers and position. As night fell, both generals pondered their next move. Tactically the result was probably a draw, with casualties somewhat over 1,000 for each side. For the Confederates it proved to be a major strategic defeat however. The pugnacious Blunt remained on the field, but Hindman pulled his army back during the night. This may have been partly another failure of nerve, but the Confederate army was short on supplies, and in particular had a severe shortage of ammunition. These problems afflicted the Rebs in our game by the way. 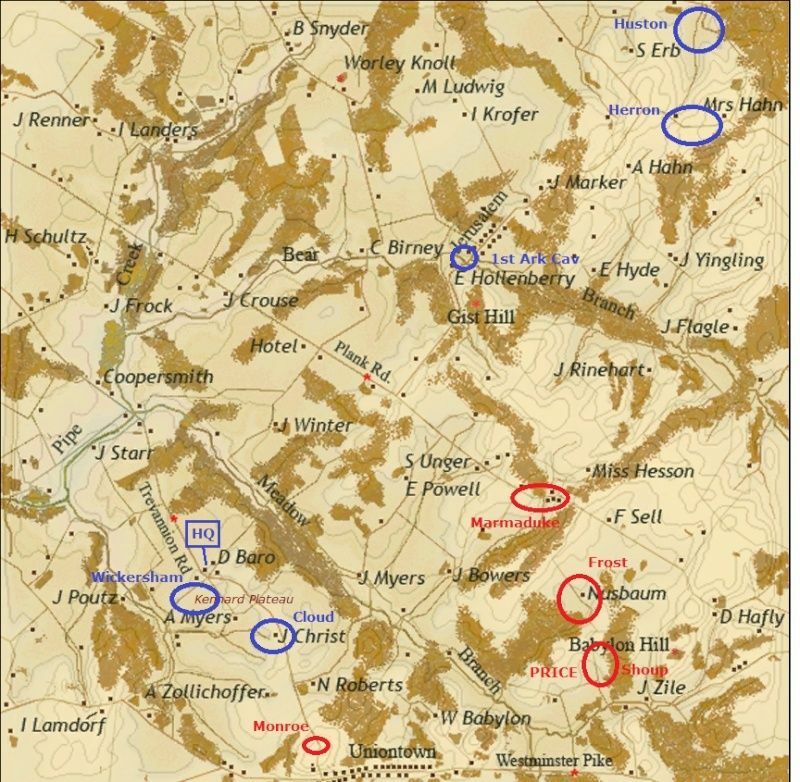 The forlorn return march south over the Boston Mountains, lead to a considerable degree of disorganisation and heavy desertion from the conscript regiments, which effectively ruined Hindman's army. This was my first scenario, and not everything went as I'd hoped. The start was delayed by over 30 minutes, because the teams went into separate rooms on T/S for discussions on their respective plans, even though the briefings had after all gone to most players over a week before the game. In face-to-face k/spiels we allow as much team discussion as players wish (provided they are together on the map), but the game goes on regardless, and the armies keep moving. I think we should follow the same approach here in future. Not that I'm blameless - I did exactly the same thing before the Battle of Harrisonburg! We then had a CTD after about 45 minutes, which necessitated a game restart. This seems most likely to have been caused by my own sloppy T/S whisper key settings. Apologies to everyone. Digby later dropped connection for probably a similar reason. I'm very glad that Jeff has started a new thread on how we can all organise whisper keys better in future. The impact of all of this meant that the game ran on for much longer than anticipated, which in turn meant that some of the players had to leave early for prior engagements. This hurt both teams, but more so the Confederates. I had deliberately staffed the Union side more fully with human players (6 players to control just 5 bgds), than the Confederates (only 5 players to control 8 bgds). This partly was intended to reflect the fact that the Union reinforcements from Missouri were over-officered, because so many of the troops had dropped out on the march. It also addressed the poor command structure of Hindman's army. The Confederate Trans-Mississippi forces tended to get the worst of everything, including commanders. Also at this battle, even otherwise good Reb generals, such as Mosby Parsons and 'Fighting' Jo Shelby, were not in senior roles, and anyway performed below their best. Given that they finished the game with only 3 human players, the Rebs really struggled on the command front, and the historical effect was way overdone in practice. Another area I'd like to look at further is our treatment of cavalry. In previously games, players have found it too easy to charge formed infantry (something most ACW cavalry commanders only ever tried once, if that! ), and were too successful when they did. I made various tweaks to the cavalry, and felt that it was sufficiently neutered yesterday. You could sometimes get it to charge guns, but little else. Which I think is about right. But I would interested to know if others agree. What does need more work is their speed (too low) and fatigue (too severe). I *think* that was realistic for the Union cavalry in yesterday's game, most of which was authentically worn-out by the exhausting march from Missouri, and generally performed poorly in the actual battle. But Jeff found much the same with the Confederate cavalry, which should have been better. Several of us had a discussion on this after the battle, and the good news is that we think that something can be done, even in MP. I will start a new thread on this if no-one else does. I think the game turned on the decision by the Union reinforcement commander Herron (played by Niall) to make a wide flank march to link up with Blunt. This was actually a very brave course of action, and could have proved disastrous if the Confederates had decided to attack Blunt instead. This long march would have given them more time to crush him. As it was, the decision proved to be inspired, and I fear poor Niall is destined for a long career as a division commander as a result. Indeed. When I got Niall's note that he was at the J. Crouse farm I began dictating the specifics for his court martial to my aide. As it turned out, I have the honor to recommend him for promotion. I had reports that Blunt was a distant relative of Lt. General M.T. Georgia. I therefore took the view that I would be damned if I was going to risk my command for that family’s avarice. Blunt had got himself into that situation and he could stew in his own juice until I was good and ready to pull him from the fire. Mr. Digby wrote: Who is General George? Hays wrote: I had reports that Blunt was a distant relative of Lt. General M.T. Georgia. I therefore took the view that I would be damned if I was going to risk my command for that family’s avarice. You have cut me to the quick. My sole goal in this affair is to cleanse the continent of the vile institution of slavery. Now should the slaver's belongings come under my administration, I will make sure that the masters will not benefit from their comfort. They were gained from the sweat and toil of those unfortunate wretches in the fields and properly belong to them and not the owners. Of course it is only just that a small commission be paid for the proper disposal of the confiscated properties. "In war the first casualty is truth".